It’s been over 15 years since I’ve written an opinion piece for The WIRE. I decided to speak up after attending a presentation Tuesday at the Good Shepherd Community Center. Over 50 people showed up to see and hear the latest on the FDR Memorial long-planned for the southern tip of Roosevelt Island. When the slide show ended, attendees came to the microphone and voiced their opinions. While most of the residents who spoke complained about one part or another of the architects’ plans, several residents rose in spirited defense of the design. I came to the meeting with no pre-formed opinion. Is granite hard or soft? Will trees enhance the view or diminish it? Should FDR’s bust face north or south? Will there be enough money to pay for the construction? Will either the City or the State pay for the upkeep? These all seem like valid questions. I don’t know the answer to any of them. Here’s what I do know. Somebody designed a memorial to FDR on Roosevelt Island that completely ignored the man’s physical disability. Franklin Roosevelt spent much of his adult life in a wheelchair. The polio virus, which infected him in 1921 at the age of 39, left him with almost no use of his legs. Twelve years later he became President of the United States. He went on to save the country from economic calamity and the world from Hitler. Many of the speakers on Tuesday night made reference to FDR’s disability as a special reason to have his memorial on this Island. Here’s what they mean. In 1970, Welfare Island housed two chronic disease hospitals and a Fire Department training station. Many of the hospitals’ patients had contracted polio before the disease was eradicated by vaccination in 1955. Some of them were in “iron lungs.” When the disease weakened the muscles of breathing, artificial respiration had to be provided. Over the years, Coler and Goldwater Hospitals pioneered the use of ventilators that freed polio victims from being tethered to stationary machines. Nancy Brown was one of those people. For more than 30 years, she has lived in Eastwood and, on most days, you can see her taking the sun in front of Rivercross. Nancy remembers the discussions of renaming Welfare Island. She remembers FDR’s connection to polio as one of the prime factors in the Island’s final name-change. She remembers Vicki Holland. Vicki was another polio survivor who had moved from the wards of Goldwater Hospital to an apartment on Roosevelt Island. A plaque memorializes Vicki at the base of the lighthouse at the Island’s northern tip. The Island’s housing was built with the disabled as a priority. Certain apartments were specially designed with wider doorways, lower light switches, and accessible bathroom and kitchen facilities. All of the public and commercial spaces followed suit. People in wheelchairs became part of the fabric of all of our lives. Roosevelt Island is a living, breathing memorial to FDR. And when we celebrated FDR Day here each year, it was clear that we were focused on FDR as an icon for the disabled. 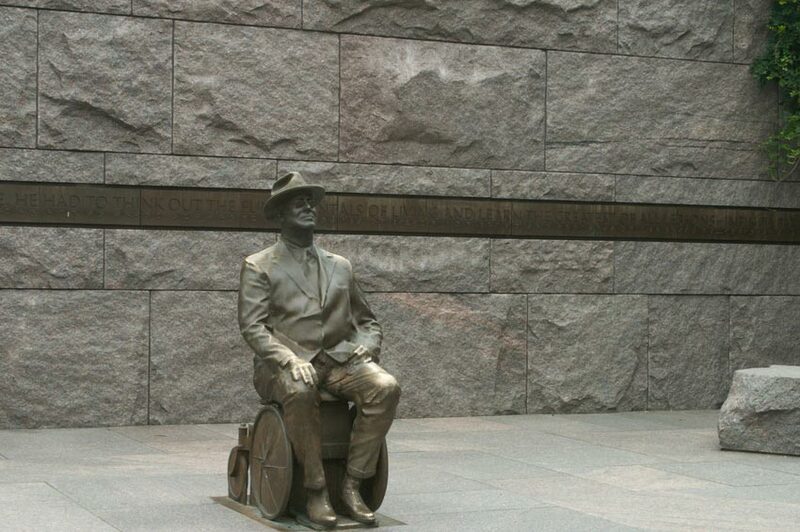 The FDR Memorial on this Island should focus on the President’s strength in conquering his disability. Many possibilities come to mind. For instance, he should not be memorialized with a bust. We should see a greater-than-life-sized statue of him sitting in a wheelchair – and he should face north toward Goldwater and Coler Hospitals. And toward Vicki Holland.